The first ever Unst Winter Festival announced it’s dates this week, and will take place on the weekend of the 11-13th December 2015. 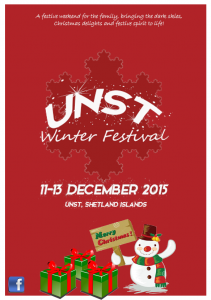 The family festival looks to bring the dark skies, Christmas delights and festive spirit to life on the UK’s most northerly island through a weekend of fun, Christmas themed, activities. Copyright © 2019 UNST: The Island Above All Others.